00:10:00 Makes 8 servings, 1 cup (250 mL) each. Makes 8 servings, 1 cup (250 mL) each. 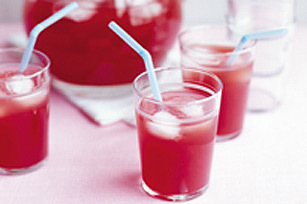 Enjoy this refreshing KOOL-AID punch! Place drink mix in glass pitcher. Add water; stir until drink mix is dissolved. Stir in ice, juice and soda. Pour into punch bowl or serve from pitcher. Try adding assorted cut-up fruit to the punch. Orange, lemon, lime, pineapple and strawberry slices make a great addition. For extra flavour, use some of the punch to make ice cubes. Add to the punch just before serving. Serving Size Makes 8 servings, 1 cup (250 mL) each.